Geographic groups is how DimDrop defines different geographic targets for messages. Geographic groups are defined one at a time by drawing shapes on the provided map view and adding additional tagging information. A geographic group can be a neighborhood, city limit, demographic market or any other arbitrary map region. 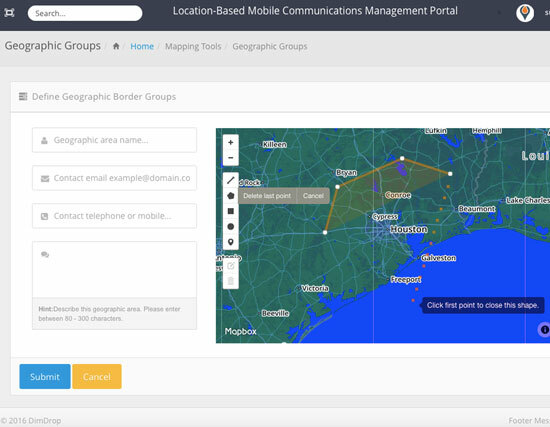 Once the geographic group has been defined you can use it when sending text alerts, push notifications or other mobile communications to target only people that are physically present in that geographic group area at the specific time your message is active. More complex geographic areas can be created by using geographic groups. DimDrop was designed to be less complicated than traditional GIS systems so that any business user can take advantage of the power of location based tools.